Incorporate a cocktail table with lots of function and a rustic country look into your living room with this lift-top cocktail table. A portion of the table top lifts up to create a functional dining or work surface while revealing storage inside. 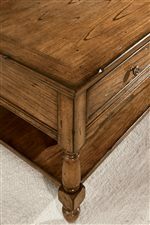 Additional storage for remote controls, DVDs, and other items is easy with the compartments within the front drawer of the cocktail table. A distressed medium woodtone finish, molding trim and turned table legs complete the style of the table. The Briarwood Cocktail Table with Lift-Top and Drawer Storage by Peters Revington at Westrich Furniture & Appliances in the Delphos, Lima, Van Wert, Ottawa, and Celina area. Product availability may vary. Contact us for the most current availability on this product. Case Detail Turned Legs. Molding Trim. Framed Sides. Make the Briarwood accent table collection a part of your decor for a refreshing look with a country cottage appeal. The medium Antique oak finish complements the wood veneers and classic look of the turned wood legs. With a variety of tables available, you will be able to pick and choose the right size and style for your living room. The Briarwood collection is a great option if you are looking for Cottage furniture in the Delphos, Lima, Van Wert, Ottawa, and Celina area. Browse other items in the Briarwood collection from Westrich Furniture & Appliances in the Delphos, Lima, Van Wert, Ottawa, and Celina area.